A hard wind blew over the grass. Although the sun was shining, a film of cloud in the high atmosphere made the sky chalky white. The scrub-brush hugged the protective curves of gentle hills, hunched bushes with upper branches bleached smooth in testament to the perpetual wind. This same wind waded through the grass, leaving a wake of flowing patterns that writhed and disappeared, only to come to life again elsewhere as the blades bent and turned. But there was one pattern that did not move. It was a line, perfectly straight, in complete opposition to the dancing flow of green all around it. This pattern did not move for its creator was not the tide of air, but a solid tire. The tire was worn with long use, scars of rocks and roots etched over its rough surface. The soft dirt it tilled was mixed into the treads along with broken blades of grass, giving the rubber a rich smell. This tire was connected to a wheel and protected by two rusted metal hubs, also dirty. The hubs were in turn bolted onto sturdy shocks that gave support to the roughly box-like shape that was balanced precariously above them. Two pieces of angular metal had been bent around this shape, like the collar of a stiff shirt. They left the back of the shape exposed, revealing the complex interlocking motion of machinery inside. A thick curved metal cap was attached just above the metal collar, leaving a gap of about two inches, out of which more machinery seemed to peer curiously at the world. A stocky exhaust pipe stood straight up from the left side of this strange machine, intermittently coughing. Across from this pipe stood a proud little plastic flag. The flag’s lower half was bright red, and the upper half was bright white. The only blemish marring the perfect square was a small chip in the red paint. The whole machine would not have stood much higher than a man’s waist, but looked very heavy. 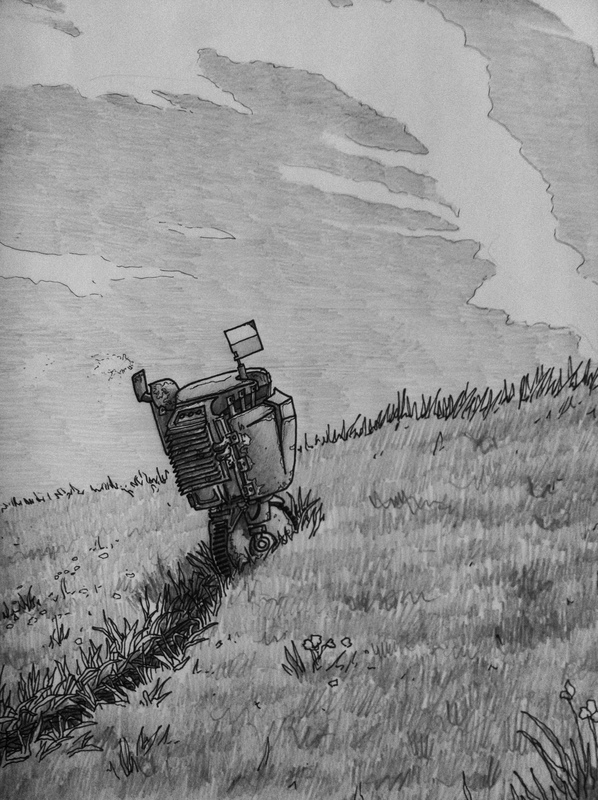 It trundled along, balancing quite well on its one wheel, the line of broken grass rising and falling over the hills in the distance the only mark of its passage. It had been traveling for a long time. It had a long way to go. The last two lines here are very evocotive and poignant. I can relate to this robot. Haha… I think everyone probably can.